If you have been looking around the Internet for the last couple months for Gingerbread, you may have found a bunch of links about a new ‘android’ called “Gingerbread”. Well, we thought we should clear up what that is so you can move onto the editable type of Gingerbread Men. 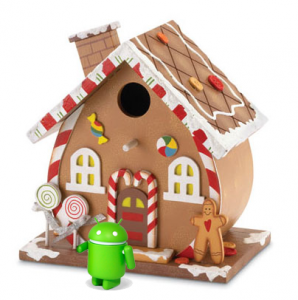 Gingerbread is a new version of an operating system from Google. It is found on many cell phones these day across all of the different service providers. Think of Android like you do of Windows on your computer. The difference is that Google encourages companies to put their own ‘face’ on top of the Android operating system… that way it’s their power in the background but looks like the way Samsung or HTC wants their phone to work. There is a lot of rumors talking about a new version of Android ‘Gingerbread’ coming out soon for the little notebooks called netbooks or iPad like ‘tablet’ computers. The big announcement yesterday was for the first cell phone to come up with the new version of the Google Android OS. It doesn’t have any ‘face’ on it so the phone works and acts just the way Google wants it to. If you want to read more about it, TrustedReviews did a post about what makes the ‘Gingerbread’ version different. Here is the old green ‘Android’ standing next to an editable house!